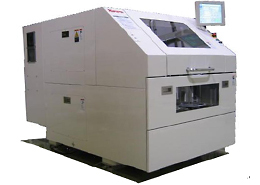 Electronic Machines | Our Products | Howa Machinery, Ltd.
Providing a host of novel technologies based on distinctive equipment manufacturing. As the IT sector grows more diverse, the functions of electronics will also evolve further. As a result, the designs in electronics will need to become denser, smaller, thinner and lighter. 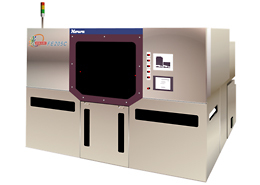 Howa Machinery has used its long-standing manufacturing expertise to develop exposure systems for printed circuit boards, ceramic green sheet-related equipment, and testing systems for mounted circuit boards, each of which seamlessly integrates proprietary technologies and the latest in high-tech parts. In turn, this equipment is contributing to many segments of the IT sector. Automatic exposure systems for various printed circuit boards designed with high precision, high quality and high productivity in mind. Ceramic green sheet-related equipment that satisfies demands for electronics which offer compact and high-performance designs. 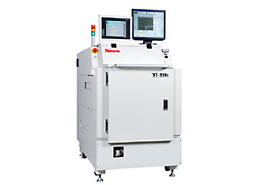 X-ray tomography testing systems ensure the high reliability of mounted circuit boards.